The government has outlined the details of its proposed digital rights agency. 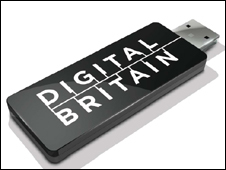 The agency -a key element of Lord Carter's Digital Britain report - would encourage people to use legal sources of copyrighted material. The proposals, which Lord Carter called a "straw man" have been published to trigger a debate on the subject, rather than an outline of future policy. "This straw man could be torched, tolerated or a touchstone for the start point of constructive debate," he said. "I for one hope it is the latter," he added. The report highlights attitude changes in the digital age, saying consumers are no longer prepared to be told when and where they can access content. "[people]do not see why a TV show that is airing in the US should not be available in the UK," the report says. "They are not willing to wait to see a film at home until several months after it has passed through the cinemas. They don't accept the logic that says that if you have bought a CD you cannot then copy that music onto your iPod." The report says this change in attitude has altered not only the way people access material, but "undermined" their willingness to pay. It says a "substantial proportion" of the population believes it is acceptable to download pirated material, because the benefits of fast and free material overcome peoples' natural reluctance to break the law. It is against this backdrop that a new digital rights agency could be set up. However, the report stressed that this would not be a government appointed regulator. Instead, it called on the industry to "come together to create a body" to deal with a number of issues, the most important, the report says, are ways of tackling peer-to-peer (P2P) file sharing. The report stressed that the role of the proposed digital rights agency would not be enforcement. Instead it looks at how the agency might tackle the problem of illegal file sharing, backed up by some legislation. This would involve an obligation on internet service providers to inform, what the report calls "casual infringers who use unlawful P2P networks" that they are breaking the law. This, the report says, would result in a "rapid and substantial drop in this behaviour". For prolific offenders, the report examines other options - such as blocking protocol or limiting bandwidth - with the most serious offenders winding up in court. The Intellectual Property Minister, David Lammy, said people should not have to understand copyright law to be able to access online media. "We need to make it easier for consumers to do the right thing. The internet has become an integral part of daily life," he said. "The real prize here is a rights agency that sorts out the complexities that keep consumers on the right side of the law, and ensure artists get properly paid. "We can't have a system where even net-surfing 12 year olds have to understand copyright in order to keep themselves and their parents safe within the law," he added. "You shouldn't need to be an underwriter to take out an insurance policy, and you shouldn't need legal training to surf the web."